The Board Director space is a highly crowded and discerning vertical to not only break into, but to also stay relevant. Challenges abound with regulation, the need for faster innovation, evolving governance & strategy needs, as well as increasing time commitments. Collectively, these challenges make for an increasingly discerning Board Member vetting and selection process - putting additional pressures on Boards to make the right appointments and for Board candidates to effectively represent their talents for serious consideration. For both sides of the table, there are common omissions and mistakes that are frequently made in the nominating/vetting process that are worth knowing. Board candidates, however, have an advantage to knowingly avoid certain pitfalls in an effort to make a great first impression when breaking into the consideration pool. Although I am not formally in the Board Director placement business, I frequently get the opportunity to make Board candidate recommendations when re-architecting Boards or building/implementing the Nominating Committee processes for clients. I am extremely picky when serving in these roles due to the fact that it only takes one wrong Board Member to wreck an otherwise effective Board. Every Director matters, and the following are areas that may help in putting you over the consideration, and subsequently the selection, hurdle. Delegating (or avoiding) the creation of your 'Board Director Brand': This truly comes down to conveying what you stand for. Only you can do this, albeit with the possibility of some helpful guidance to maximize your impact. Simply posting your experience and skill sets is not only bland and boring, it also doesn't give a Nominating Committee or a Board a feel for you - personally. Get yourself quoted in Board-related publications, write an article, show your holistic Board knowledge and thought leadership. This approach is leveraged by aspiring Board Directors as well as career Board Directors. You need to continually show your relevance. 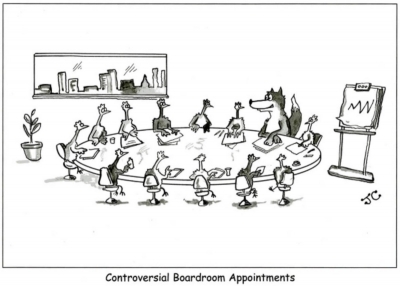 The Board Directorship vertical as a whole has been slow to adopt self-promotion approaches in what was seen by many as a stigma in the stuffier Board arena. Now, this gap has increasingly been filled by many individuals standing out in this vertical (more on this in the article 'The Once Taboo World Of Board Director Marketing'). Submitting a Resume or CV: Ouch. This is a prevalent mistake for multiple reasons. First, not knowing that a typical resume or CV is an improper submission for serious Board consideration shows that you don't view Board Directorship as a discipline. It actually screams "let's give this Board thingy a try," or "Board Directorship could be a great hobby for me." Secondly, a conventional resume or CV can't (and doesn't) properly convey the experience, skill sets, and acumen of a serious Board candidate. Why? A resume or CV format can unknowingly guide you down the path of sounding more like management material instead of leadership, or better yet, governance material. Make no mistake, there is a huge difference - and seasoned Nominating Committees and Board placement entities can spot this a mile away. What you need is a properly constructed Board Document to represent you as a seasoned and formidable candidate (or, if in the early stages of pursuing the Board Directorship route, someone who 'gets it'). As some say, a great Board Document should dare them not to appoint you! (more on proper Board Document construction in the guidance article, '7 Steps To Create A Killer Board Document'). Not correlating your personal Values to the organization's Values: This is another extremely common missing component in a Board candidate's repertoire. Everyone has experience. Everyone has skill sets. But what about your character? ...and what you stand for? A powerful and effective way to accomplish this is to correlate your 'character' components to your very own personal Values, and in turn, correlating these personal Values to the company's (and Board's) Values. Boom! You may have just made it to the top of the consideration pile. This takes a little bit of work, but is invaluable in both your Board Document as well as in interviews (more on this concept in the article, 'The Story of Company Values'). Focusing too much on Governance and ignoring Strategy: Borrowing from a previous article I wrote entitled 'Why Do Boards Continue To Struggle With Strategy?,' "Boards of today continue to struggle with what 'strategy' actually means ...and it is deeply hurting the companies these Boards serve. How do I know this unbelievable and sobering fact? I work and consult with many of these Boards. No need for big data here to come to this conclusion. This lack of strategy understanding is true of both Directors' actions operating within their Board duties, as well as in their construct of guiding and supporting a company's strategic plan. But how can this be? Aren't all Board Directors experts at strategy & strategic planning, and at the very least, have an in-depth understanding of what it is? Sadly, no. When asked point blank the question, 'What is strategy?,' which I often do of Boards, it is extremely rare to get a correct answer. This lack of understanding leads to a whole host of problems, many of which a Board is instituted to safely assist a company to navigate." Board Director candidates with true strategy experience, and who are able to speak about and apply it effectively, set themselves apart from the rest of the pack. Aim to balance your Board Director 'packaging' with equal amounts of governance and strategy application. Missing the entire 'package': I mention this concept of 'packaging' continuously in my speaking and coaching work. This is not by chance. With the goal of sending a message that you are balanced and mindful in your Board Director discipline, the importance of this balance cannot be overstated. So, what is this concept of 'packaging'? Quite simply, it is addressing, speaking of, and aspiring to balance the components of Expertise (know-how), Experience (application), and Proof (certification) in the disciplines of Board Directorship. Many candidate evaluation processes unknowingly incorporate some, if not all, of these 3 components in their evaluation processes, but the true effectiveness comes when there exists a concerted effort to evaluate the cohesiveness across these verticals. A Board candidate can leverage, and direct, this concept themselves in an evaluation process by automatically guiding the discussion to these three areas of importance (more details on this concept in the article, 'The Serious Board Candidate & The Career Trifecta'). If you are traveling down the path of Board Directorship, or looking to add additional Board seats to your portfolio, give yourself a significant advantage. Turn these 5 common mistakes into personal centers of excellence in how you present and convey your talents. It may just be the deciding factor in your Board appointment(s). How will you increase your chances of Board Member appointment? Reach out directly to Mark A. Pfister to significantly increase your chances of Board Member appointment with his 'Becoming an Exceptional Board Director Candidate' course and 'National Speaking Tour' on the topic.